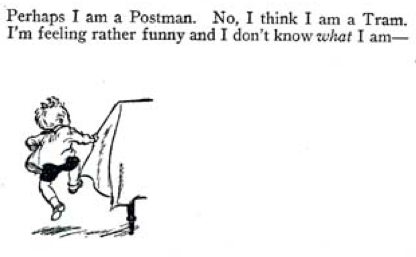 When A.A. Milne penned his famous poem, ‘Now We Are Six’, he displayed a completely accurate understanding of the different stages of children’s interaction with the world. Now my son is six he really does believe that he is, ‘as clever as clever’, and seems to require an awful lot of negotiating to get anything done, if things are not going his way he has taken to putting on a whiny noise or fake crying, which is profoundly irritating. He frequently reprimands me if I have forgotten to use my telepathic skills to remind him to do something that only he knows that needs doing, and gets annoyed with me if I keep mentioning that he should be doing this or that. He is a very good reader and good at comprehension so he doesn’t require my assistance very much when he does things on the computer because he can follow the instructions. Most of the time I feel as if we are only getting away with him not turning into a complete horror because he is fundamentally a good child. Alistair is a bit torn between growing up and staying a little boy, he enjoys his exciting dreams, digging in the sand pit, collecting sticks and stones, wearing face paint, baking and talking to imaginary friends. He often says that he doesn’t want to grow up (I have told him nobody does – it just happens) but can articulate that feeling so well that I am impressed with his use of language. For all of his bravado he still likes me to rescue him from the top of the climbing frame in the playground but is very comfortable using the Trim Trail in school. I have to admit that I really like it on the very odd occasion when he is ill, not in a Münchhausen By Proxy kind of way, because he becomes my baby again and is soft, cuddly and isn’t bossy for a short while. However once he is back to full health he is like a busy bee exploring the exciting world around him. If you look up childhood milestones on any parenting site one of the main characteristics of a six year old is the desire to test boundaries and see how mad they can drive you. Apparently you are meant to stick to your guns and not budge, we however fail on that parenting advice and still work on the principle of choosing our battles wisely and then putting our foot down when, ‘peas get above sticks’, as my Grand dad used to say. One battle we seem to be having at the moment involves teeth cleaning and saying that all of his teeth will fall out isn’t washing because the little entrepreneur that he is just works out how much money he will get for his teeth. Also telling him that the Tooth Fairy won’t take his teeth doesn’t wash because that is just silly. We have talked to him about the long term health implications of not cleaning your teeth and allowed him to watch little snippets of ,’The Truth About Your Teeth‘, on BBC 1 and he is slowly coming round. When we visited the dentist, the dentist was impressed with his teeth and was surprised that he had made them sparkling white himself – I think that the fact that he just drinks water or milk and only gets sweets in rare batches helps too. Prevention is always better than cure. Alistair is really looking forward to the school holidays and so am I – it is a time for enjoying life just because you can, not to tick off boxes so that you can be categorised. The greatest thing I want for Alistair is that he enjoys being who he is now in every stage of his life and can find his inner-peace when I am not nearby. How Do You Decide If Your Child Is Too Ill To Go To School? Illness has always been one of those things that I am terrible at judging, particularly with my own health. For some bizarre peculiar reason I don’t consider myself to be ill until I can’t function properly and am unable to do the smallest things. Unfortunately this has often resulted in me battling on incompetently and admitting defeat in a flood of tears. Everyone around me seems to know when they are ill and are really good at discussing symptoms and how it is effecting them. My inability to detect illness makes it quite difficult for me to decide how ill my son actually is and therefore he has missed very little school because if he can walk and talk then he is well enough to go. Last week he was really tetchy and everything I did or didn’t do for my son seemed to be an indication of how little I cared for him. We went to the playground to play on the playground equipment and the mere prospect of leaving caused an unprecedented amount of fuss – well out of proportion to the request. I had an inkling then that maybe he was going in for something and that hunch was correct as he spent most of the weekend sleeping and watching Miss Marple. We decided to keep him off on the Monday to let him rest more until he felt better. 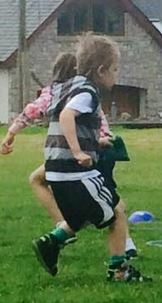 On Tuesday he woke up saying he didn’t feel well enough for school and I wrongly assumed it was because he had enjoyed being off too much so I sent him in anyway, dressed with green socks for sports day. He did pretty well and won one race, came second in three and lost another. Near the end of the school day I had a phone call informing me that Alistair was feeling sick and needed to be taken home. Obviously I had made the wrong decision and he was in fact ill and maybe should have been at home. As a result of this I am keeping him off for two more days and have had to cancel a much awaited play date – he didn’t make a fuss about that indicating that he really wasn’t feeling very well. Alistair is very rarely ill and is always on the move so when he told me he felt ill and stayed unnaturally still I should have listened to him instead of suspecting that he was trying to miss school. Being a parent is so difficult at times because you swing from worrying that they are seriously ill and in need of hospital treatment to missing the signs that they are ill.